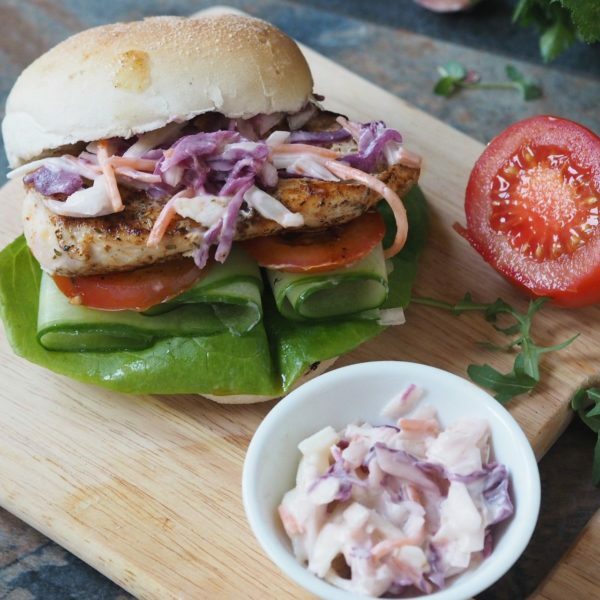 Try this recipe for delicious Chicken Burgers with Honey Mustard Coleslaw! Choice of your fillings: Cucumber, tomato, pickles, onions. Mix all coleslaw ingredients and refrigerate. Take one chicken fillet and cut in half horizontally into two thin, equal sized fillets. Repeat with the other fillet then place each piece of chicken into a freezer bag and use a rolling pin to pound the chicken flat. Put the flour into a bowl and season with 1tsp each of salt and pepper or to taste and mix well. Break the eggs into a separate bowl, lightly whisk then dip each chicken piece in the egg draining off any excess before dipping into the flour mixture. Heat up oil in a frying pan on a medium to high heat and add in the chicken pieces. Fry the chicken on one side for 3 – 4 mins then turn over. Reduce the heat to medium then fry for a further 5 – 8 mins or until then chicken is cooked with no pink in the middle. Place 1 chicken pieces onto one half of a burger bun. Add in any filling of your choice and top with coleslaw. Close the burger and enjoy!